Hydrogen is a colorless, odorless and highly flammable, nontoxic gas. The gas is flammable over a wide range of concentrations and requires a minimum ignition source, only one-tenth of the energy required for gasoline vapors. Hydrogen burns with a nearly invisible blue colored flame, unless contaminated with impurities, in which a pale-yellow flame is visible in low light conditions. Hydrogen gas is flammable and explosive when compressed and poses an immediate fire and explosive hazard when concentrations exceed 4%. The nontoxic gas has been used in many industries and is commonly used as a filler for oxygen sources for underwater diving, a power source for aerospace and aircraft operations and an energy source for fuel cell powered vehicles. The primary health hazard associated with hydrogen is the probability that the gas could displace air in a poorly ventilated or confined space, resulting in asphyxiation. Since the nontoxic gas is flammable at only four percent in air, burns and physical hazards that can result from a fire or an explosion can be detrimental to persons in the general area of the explosion. Hydrogen cylinder storage safety illustrated by US Chemical Storage. Hydrogen cylinder storage safety precautions must be addressed to maintain a safe workplace. Exposure to an oxygen-deficit atmosphere, caused by hydrogen, may cause nausea, drowsiness, dizziness, vomiting, excess salivation, loss of consciousness and death. Under any circumstances, in which hydrogen is accidentally released, all personnel should evacuate the immediate area. Shut off the source of leaking hydrogen if possible. If leaking from a cylinder or valve, alert an emergency response crew and/or local officials. Store hydrogen cylinders upright with valve protection cap in place. Firmly secure cylinders to prevent from falling over or from being knocked over. 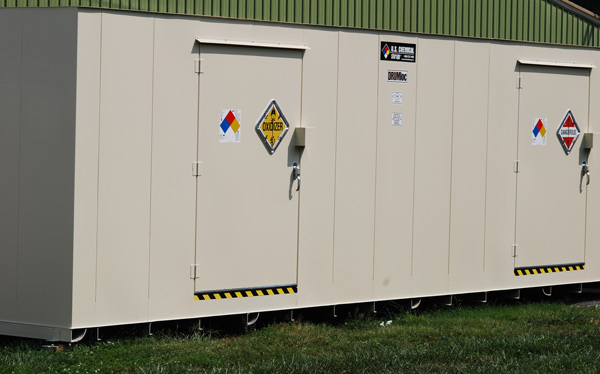 Ensure climate controls in chemical storage buildings to eliminate the chemical’s volatility. Protect cylinders from physical damage by transporting them properly; do not roll, drag or slide cylinders into storage areas. Ensure that storage atmospheres are free from sources of ignition; including improper electrical sources (utilize explosion proof electrical equipment) and direct sunlight. Implement proper ventilation systems inside chemical storage atmospheres to eliminate possible hazards. 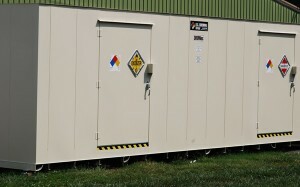 Hydrogen gas is an extremely light gas and may collect in the top of buildings that do not include proper ventilation. Connection must be made before opening the hydrogen cylinder valve, since self-ignition may occur. If personnel have difficulty with operating the cylinder valve, contact the supplier. Only use CGA connections when operating the hydrogen gas cylinder. Never insert an object (e.g., screwdriver, pry bar, etc.) Always use an adjustable strap wrench to remove over-tight or rusted caps. Do not strike an arc on a compressed gas cylinder. To learn more about the storage of gas cylinders and safe storage solutions, visit us online or call 1-888-294-2729 for a free chemical storage consultation.